The images of swirling dust over deserts and plumes of sea salt off the ocean are stunning and amazing. 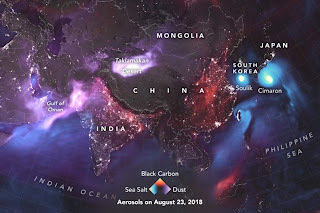 It's a new and innovative illustration in which NASA showcases the invisible atmospheric world of the tiny particles swirling around us. It demonstrates that dust clouds blanket large parts of the earth. The particles include sea salt, black carbon soot from wildfires and emissions from heavy industry. NASA combined data from multiple sensors on satellites as well as ground based sensors. Massive storms that hit Hawaii and Japan spewed sea salt plumes into the atmosphere. Landlocked winds over NW China and NW Africa unleashed huge dust clouds into the air. This map isn't a single image or a montage of images. 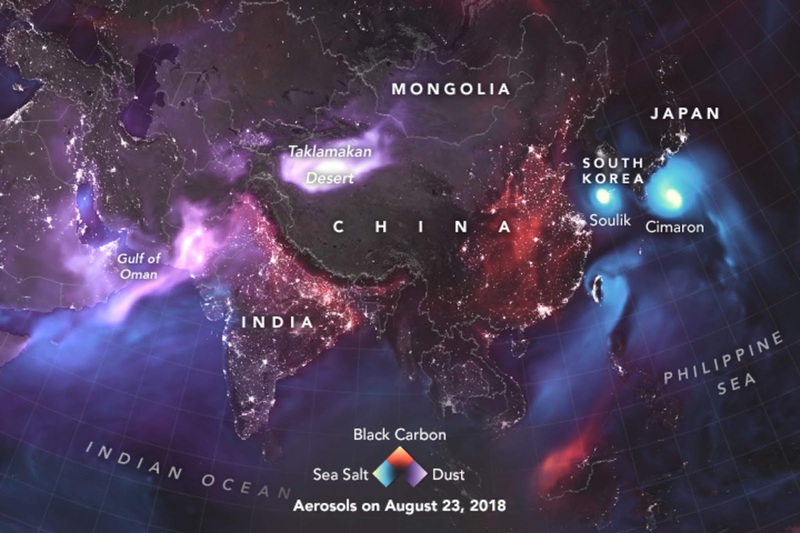 NASA used mathematics to bring together data from different sources to determine where the densest concentrations of particles were in late August. It's an amazing view.